One of my favourite go to morning breakfasts! This is so yummy but so good for you! Pour Chia Seeds into a bowl and cover with just enough water. Soak Chia Seeds for 5 minutes. Blend 1/3 of the yoghurt, chia seeds, (and the water the seeds were in) and 1 small banana. 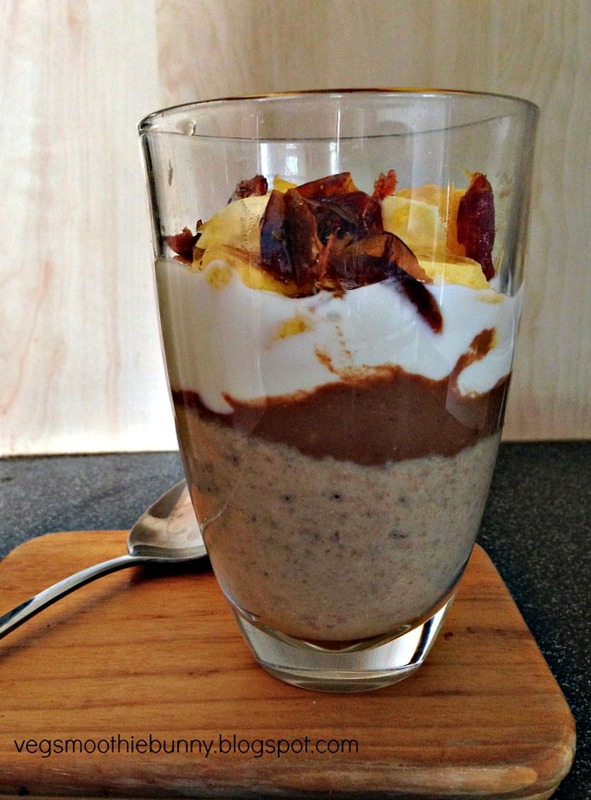 Blend peanut butter, 1/3 yoghurt and cocoa powder. Top off with sliced bananas, diced oranges, pitted and diced medjool date or other toppings of choice. p.s Normally in the mornings when I’m in the rush, I just take all the ingredients, blend it and run out of the house. Still yummy! But making it like that is both great for the tummy as well as the eyes. And it’s always nice to have a bit of ‘mouthfeel’ from the sliced bananas and the sticky Medjool dates! Want to know more about the goodness of chia seeds? Just 1 oz of it has 4.7g of protein and 10g of dietary fibre! (Trumps everyone’s magic brown rice out of the window!) Find out more here! These pancakes are delicious on a lazy saturday morning. Refined carb free and no added sugar, this yummy meal will keep your blood sugar levels steady and you happy! Heat 1 tsp coconut oil in a pan and drop mixture on to pan. I made them coin sized because they are just so cute that way. Cook on each side for about 1 min, depending on the size of the pancake. Resist the urge to flip them over till you see bubbles forming on the top of the batter. 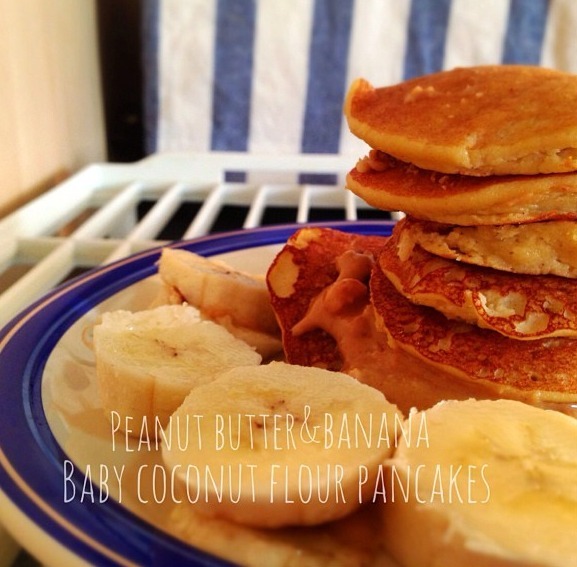 Stack pancakes with a generous smear of all natural, no sugar added peanut butter (I recommend Adam’s!) and slices of banana. Sprinkle with silvers of almonds or top with maple syrup if you like.